Popping the question isn’t just for engagements! Asking your besties to stand by your side is a special recognition of your friendship. Show your girls just how much they mean to you by creating something just for them. Be unique, be creative, be you. And let the wedding fun begin! Start with the stationery. 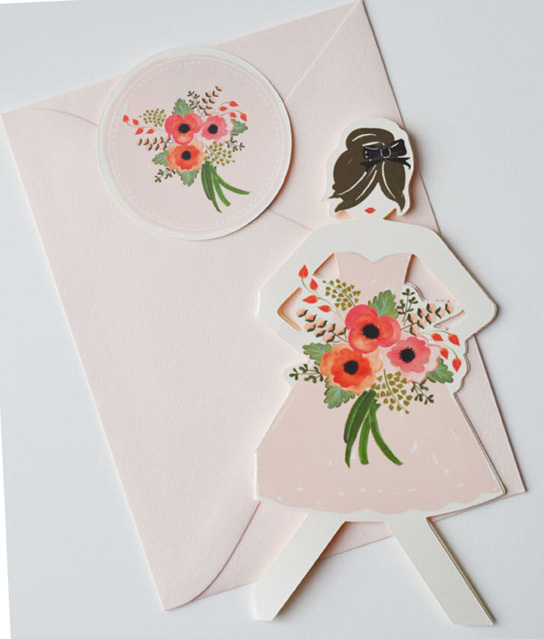 These beautiful watercolor-style cards from The First Snow come with custom options for hair color and dress style, as well as different wording for maid of honor, flower girl and more. Perfectly pretty! 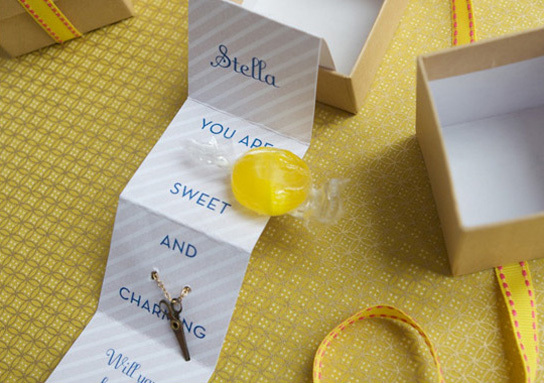 Not only are these 3-D pop-up cards bright and fun, the puns complete the package. 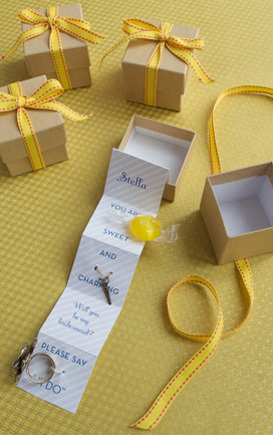 Include a cute necklace charm and a little candy for a sweet, charming way to ask your bridesmaids to join you. Instructions and DIY at Project Wedding. 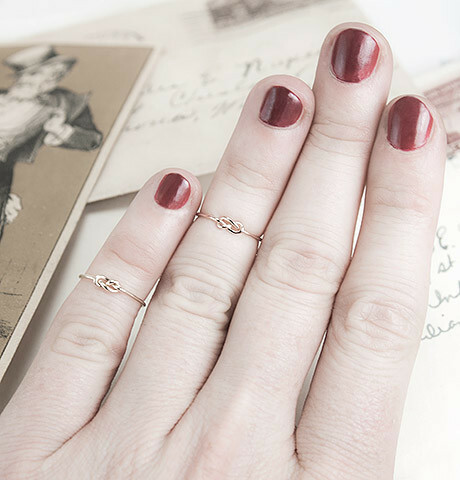 What better way to ask your bridesmaids to join you on your wedding day than with a delicate midi-ring with a tiny knot? 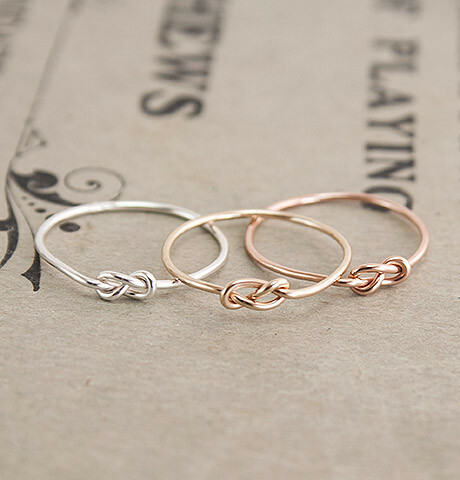 These ones from Erica Weiner are very feminine, great for everyday wear and come in silver, rose or yellow gold. 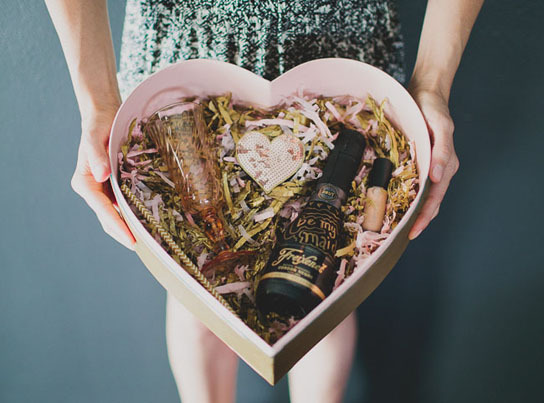 Provide the excuse to celebrate with you by gifting a vintage Champagne flute and mini bottle of bubbly to celebrate, all packaged in a too perfect heart-shaped box. An easy DIY project at Green Wedding Shoes. Planning a destination wedding? Swap out the box for a miniature suitcase! 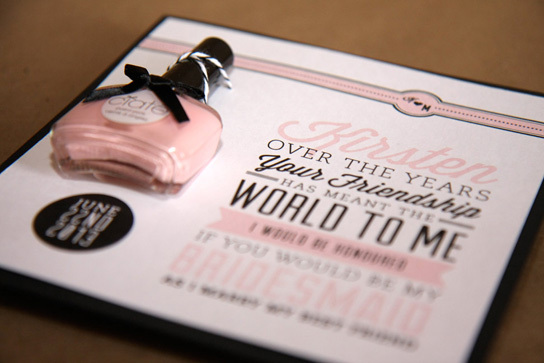 Include a pretty polish (perhaps in the wedding palette you are pondering) like these request cards from Creative with a K.
This DIY project is a lovely way to (literally) pop the question! 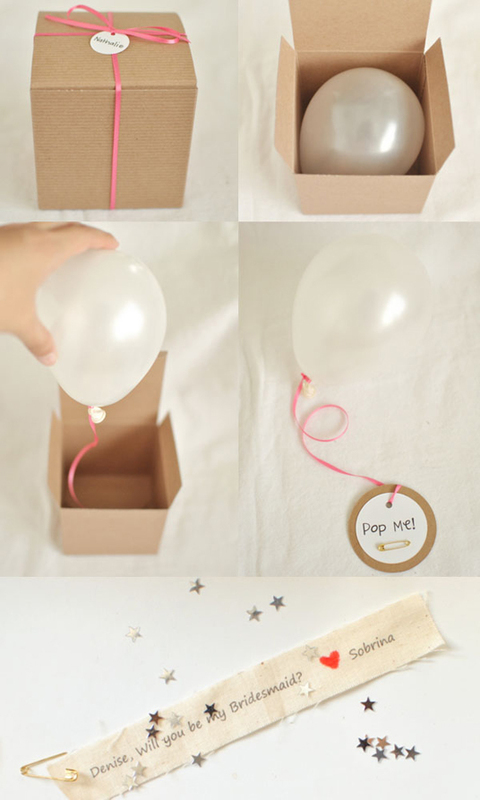 A whimsical balloon in a box is popped by the recipient with a super special request and a sprinkle of sparkle inside. Instructions and details on how to make this at Quiet Like Horses. 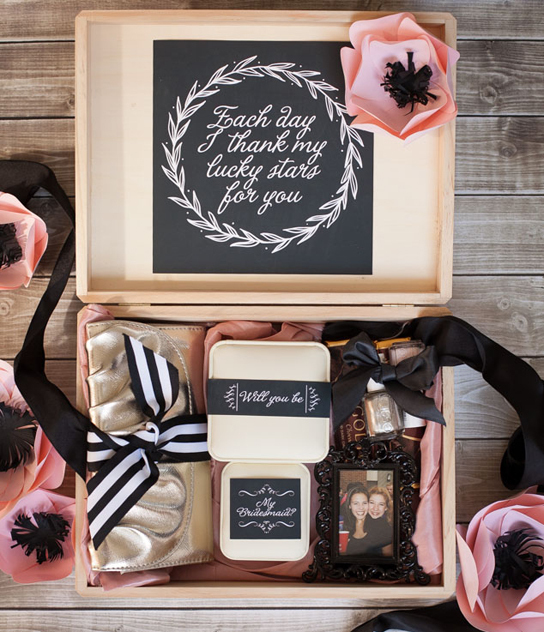 A pink paper anemone tops this pretty box packed with momentos and adorable gifts, making the perfect bridesmaid proposal present. Tutorial and instructions on how to make this yourself at Frog Prince Paperie. 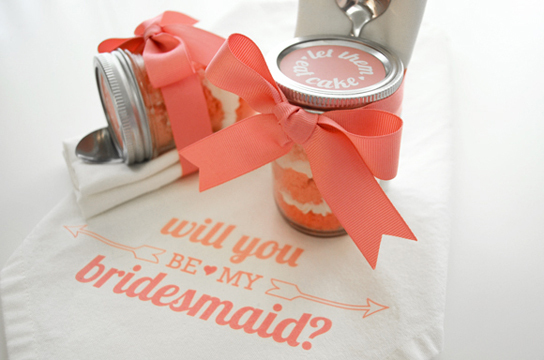 Nothing sweeter than a little treat to pop the question, like these cupcakes in a jar. 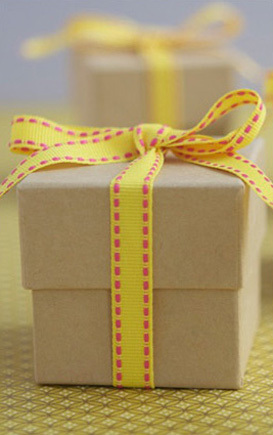 Free printable and instructional how-to at Marry This. Mam wraÅ¼enie Å¼e wielu nadinterpretowuje ten tekst, to nie jest naÅ›miewanie siÄ™ z biedniejszych ani krytyka.UderzyÅ‚o to w Was bo moÅ¼e sami dotkliwie odczuwacie swojÄ… sytuacje ekonomicznÄ… ( jak wielu PolakÃ³w) , moÅ¼e dlatego wzbudziÅ‚ takie emocje bo odnieÅ›liÅ›cie to personalnie.Ja odebraÅ‚am to jako po prostu opis kolorytu takich miejsc jak ryneczki miejskie, zresztÄ… fajny opis. PrzypomniaÅ‚ mi siÄ™ ten rynek baÅ‚ucki, jego koloryt i gwar.Pozdrawiam.